We are on the cutting edge of the tree transplanting service business. Not only do we grow our own trees and deliver them straight to your yard, we’re also able to take existing trees from your property and move them around. Whether you want them to stay in your yard or taken off your property completely, we’re able to do either job. Moving a tree can seem like a fairly cut and dry project, but in reality it’s much more difficult than that. 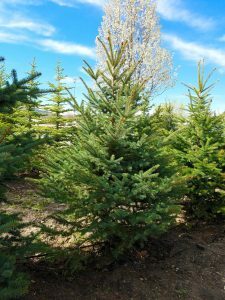 There are many things to consider when transplanting a tree: season, how large the tree is (height, girth, and root ball), where you’re transplanting it to, soil in both areas, and weather conditions. The best time to transplant a tree is going to be early spring or late fall. This is because the ground is soft enough to dig without too much effort. The trees also aren’t going to be in their main growing phase, so you’ll disrupt their life cycles the least. It also makes the most sense as those times of year are when the trees haven’t yet bloomed or have already done so. The tree’s size will affect a lot of things when you transplant it as well as years down the road. My dad always used to say, “measure twice, cut once”, and that adage applies here. You’ll want to make sure that there’s enough room right now for how large the tree is, but you’ll also want to look to the future and make sure there’ll be enough room for it to grow. Once you’ve made sure of those two things you’ll want to cut around the base of the tree far enough out to gather in the majority of the roots (the root ball). This will change based off of how large the tree is, but a good rule of thumb is to start out at least three feet from the tree. When you go to plant the tree in the new location you’ll want to dig down about 1.5 to 2x the depth of the root ball, giving it enough room to be properly transplanted but not too deep as to cause rotting or sinkage. The soil is another factor to take into account. Here in Utah there’s a ton of rocks in the soil, as well as a decent amount of clay. You’ll want to take as much of the soil around the root ball with you to the new location and have some good soil available to fill in the holes. We recommend any decent (mid-grade or higher) soil or fertilizer mix to help the tree flourish in the new location. A word of caution, the root ball will be quite heavy due to the amount of soil you’re taking with you, but that’s okay. Don’t try to shake it out or make it lighter as that soil is crucial to the survival of a successful transplantation. We hope that you found this article helpful. If you’re able to move the tree yourself then that’s wonderful! If you need some help, we hope you’ll contact Willowcreek Tree Farms as your tree transplanting service experts. Wayne is a Utah native who grew up around all sorts of pine trees. In his early 20's he spent some time as a wildland firefighter and grew to better understand the lay of the land and the different types of trees that Utah has to offer. He enjoys educating people on the pros and cons of trees.